A few months ago my life changed for the better. At one of the orientation sessions at Boston University that I was working I had a girl come up to me to introduce herself to me. This girl was Laura LaBrecque. After shortly chatting at orientation we exchanged information and kept talking. And kept talking. And kept talking. The two of us hit it off faster than Usain Bolt in Heelys. We immediately bonded over our shared taste in music and monster senses of humor. Most of the time it would be us teasing one another or making offensive jokes to make the other laugh. For example, on one occasion when Laura and I were relaxing together I told her about my wish to “throw her off a bridge.” This was entirely designed to make her laugh – it did – and terrified her. It remains one of the strongest parts of our relationship. Yes, we are weird. We hung out a few times in the coming weeks. Thankfully, Laura lived a short train ride out of Boston and could come see me. We went to go see the Red Sox-Yankees game at Fenway in August together. We went to go see Guardians of the Galaxy together. We ate Chipotle and Tasty Burger together. It was magnificent. We got along on every level you could imagine. Movies, politics, music, food, humor, candy, snack cakes, the JFK assassination, disdain for people misusing commas – everything. When I headed back home in late August for a few days I plucked up the courage to ask Laura if, while I was home, I would be able to refer to her as my girlfriend. She said yes. We made it Facebook official a few days later and thus started a swarm of my friends asking me about her and requesting to meet her. Since moving back into BU I have been able to see Laura regularly, as she lives just a short walk away from me. We have ventured out on dates and gotten plenty of snacks together. 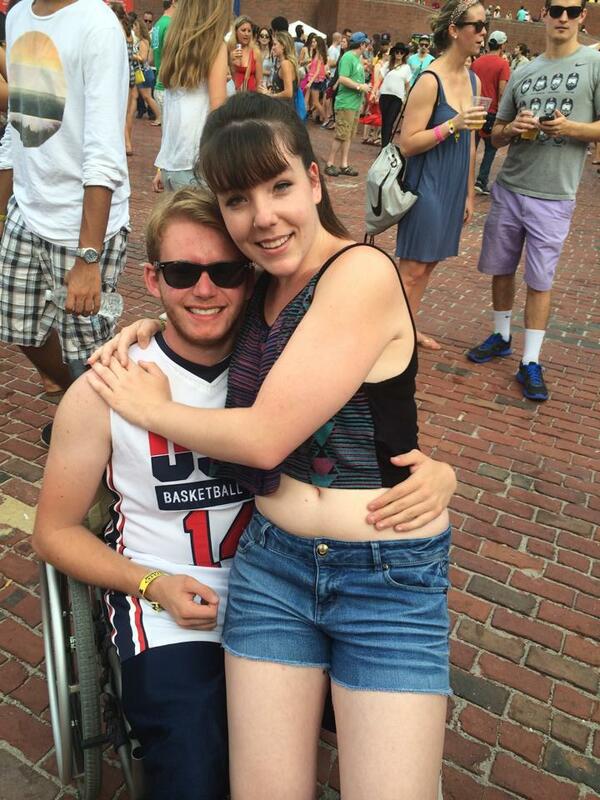 A few weeks ago we went to Boston Calling together to see Lorde and Childish Gambino. After having to evacuate the concert due to a thunderstorm we ended up shopping around Faneuil Hall. This, accidentally, became one of the most fun afternoons of our lives. We looked at random things, like a backpack shaped to be the head of a lion, and just had fun before returning to the concert. When we reentered we were faced with ever single concertgoer lined up in front of us. I then proceeded to turn to Laura, smile, and cut through a line of over 4,000 people like a chainsaw through a cupcake. We got back in when there was maybe 200 people inside the gates with over 100 being staff. We went back to our vantage point for Lorde and Gambino only to find out that the handicapped accessible platform was now inaccessible thanks to the rain damaging the chair lift. Laura was actually more upset about my accommodation than I was, which speaks to how awesome and caring she is. I was able to get us taken care of to the tune of VIP seats for Childish Gambino. Laura and I agreed that because of the sheer randomness of this all, and the fact that a thunderstorm actually provided us a seat upgrade, it was the best night. That it was. As normal, Gambino killed it and made a fan out of Laura. Today I get to make the trek from my room in west campus to Laura’s in east campus, with birthday gifts in tow. I get to spend the day with the most special girl. The person who I can go to any time of day and she will make me laugh. I get to spend the day with my absolute favorite. I get to go celebrate the birthday of my boo. That makes today a great day. Happy Birthday Laura. XOXO.